It’s that time of year again, and the fellas at National Parks at Night are here to help you find the best ideas for that special person in your life. Welcome to National Parks at Night’s second annual Holiday Gift Guide! We’ve compiled some of our favorite things that help us explore and enjoy our parks more, and that help us capture and create more dynamic images! We kept our eyes open all year, tested the tools, and collated the absolute best and unique gifts that will warm the heart and hearth of any fan of national parks and night skies. We’re providing all of our findings as a free downloadable PDF ebook, so you can read it and reference it on any device, anytime, anywhere. Inside you’ll find products from major brands such as B&H, Peak Design and Nikon, along with great little finds from smaller companies and startups. You can download it below, or keep on scrolling. Help us spread the cheer by posting our guide on your favorite social media channels and share it with other like-minded photographers, friends and nature buffs! Wishing you all the very best, and hoping that you are taking advantage of seizing the longer winter nights! Note: If you decide to purchase any of the items in this gift guide, please consider using the links included, as many help earn a small commission that help us improve the National Parks at Night workshop program. To wander without being lost, we all need some sort of guide—whether that be spiritual or bound paper. For the latter, wander no further down the book aisle than Atlas Obscura: An Explorer’s Guide to the World’s Hidden Wonders, a how-to and why-to for finding the world’s best off-the-beaten-path and out-of-the-box travel locations. A regular travel guide would bring you to New Zealand, while Atlas Obscura brings you to the glowworm caves of North Island; a regular guide would show you how to safari in South Africa, while Atlas Obscura tells you about the pub inside a giant baobob tree. Don’t be just a traveler—be a discoverer, with Atlas Obscura. Sometimes, charisma is not enough. To make the right mood happen, you need a little help. Grab a can of Atmosphere Aerosol to create additional mood, or to reveal the path of your light sources. Truly exceptional results with light painting to add drama to any scene. Have a photographer friend and don’t know what to get them? Let photographers choose their own gift at the world’s biggest and best resource for all your photo, video and image-making needs! We’ve never met anyone who complained about receiving a B&H Gift Card any time of the year! Photographers who have been around the block a few times will no doubt remember the phrase “f/8 and be there,” the street and event photographer’s motto and standard answer when asked, “How did you get that shot?” We revised the terminology for 21st century night photographers, and it’s become a rallying cry for us at National Parks at Night ever since. Show off your stars and take it as a point of honor to get out from behind your computer and set up your camera under the starry night sky. This super-soft, navy blue, Next Level poly/cotton crew shirt is available in sizes from small to 3XL, and is printed with glow-in-the-dark ink so you can read it when it really counts! In this digital age, we often forget to take our amazing images off the computer and make prints that we can share—prints that will last a lifetime. We absolutely love the image quality and longevity of Bay Photo’s metal prints. Sizes range from 2x3.6 inches to 4x8 feet, and five distinctive metal surfaces help you bring out the best of your work. For our night photography we prefer their mid-gloss and satin surfaces. Bay Photo also makes books and calendars, and our favorite standard floating prints are their thin wraps. So give the gift of a print or help a photographer celebrate their work on the wall. Special offer: New customers to Bay Photo get 25 percent off their first purchase. Exclusive to the National Parks at Night community and If you are already a Bay Photo customer: Use the promo code “NPANM10” for 10 percent off metal prints , excluding Clusters and Splits; good through December 29, 2017. We spend so much of our time looking at images on small screens––phones, tablets, laptops. While the quality and resolution of these screens has improved dramatically in recent years, they are no substitute for a quality display with accurate color that any serious photographer needs to produce quality work. BenQ makes some of the best there are. The National Parks at Night crew uses the SW2700PT 27" Widescreen LED Backlit QHD Monitor, which features 99 percent coverage of the Adobe RGB color space for more accurate color representation and features 2560x1440 QHD resolution with 109 pixels per inch for increased clarity. In short, display your photos with the best possible light! If you want an app to help you navigate the national parks and all they offer, you’ll find no need to look further than Chimani. Not only do their apps give you the what and where of the parks, but they provide the photographer with critical information, including sunrise, sunset, moonrise, moonset, golden hour, blue hour times and more, including photos of popular and out-of-the-way shoot locations. The apps are free (yay!) but the gift idea here is a membership to the Chimani Perks program, which provides discounts and special offers throughout the national parks and the communities that serve them. Along with a good flashlight for light painting, the headlamp is one of the most useful tools in the night photographer’s tool bag. In keeping with their tradition of high-quality, durable flashlights (preferred by National Parks at Night instructors), Coast offers an extensive line of LED headlamps. Our favorite is the FL75R, which features focusable wide-angle beams, low and high output, and dual-color beams with red to preserve your night vision. Special offer: Use the code “parksatnight” for a 30 percent discount available only through National Parks at Night. The perfect gift for the shutterbug in your life: a luxurious leather wallet with slots for four SD cards, credit cards, an ID and more. We discovered this at the PhotoPlus Expo in New York City this year and ordered one on the spot. Bye, old wallet! Hello, new friend. Can’t make it to a workshop this year? No problem, we’ve got you covered. Our team got together and spent a week recording our favorite night photography topics, with CreativeLive, the best in the business at bringing high-quality instructional videos via livestream and download. Our CreativeLive Night Photography Week videos cover everything from night photography fundamentals to scouting to astro-landscape to light painting to night portraiture. Great for the photographer new to night photography as well the seasoned enthusiast. Quiz: How many dots does 5760x1440 dpi yield in an 8x10-inch print? 663,552,000. That’s what you can expect from this new Epson P400 printer that packs advanced tech with simplified use. Print borderless at 13x19-inches or stunning Milky Way panoramas up to 13x129 inches with roll paper. Prints for the win! Special offer: $100 rebate until November 20, 2017. See details when clicking the link above. We understand. Everyone’s Lightroom catalog can get out of control. But don’t worry, our friend Tim Grey can help. Check out Tim’s “Cleaning up Your Mess in Lightroom” video. Tim’s a great instructor and his video will show you how to bring order to chaos in your Lightroom world. Or, even better … this video is part of Tim’s overall-excellent “Mastering Lightroom” bundle of downloadable tutorial videos, which will help you organize and optimize your photos to the level that only Grey learners achieve! Special offer: Use coupon code “night” during checkout for 20 percent off any course or bundle. If you like shooting wide, you’ll love the Irix 11mm lens. A true rectilinear lens, this is no fisheye. Did we mention it’s wide? You’d better stay behind the camera when you use it, otherwise you might just end up in your own shot. Irix lenses are available in two versions: The all-metal Blackstone, and the lighter-weight Firefly. Both versions feature a solid and sure manual focus ring with an infinity detent and a unique focus-locking ring. Once you achieve infinity or hyperfocal focus, lock it down, and don’t worry about focus again. Perhaps no other light painting tool comes closer to actually being able to paint with light than these fiber optic brushes. They are especially useful for portrait work and they are most effective when used to actually brush the subject during a long exposure. The black version of brush shows light only at the ends of the fibers, for precise placement of the illumination. The white version creates broader, softer strokes, and lights a larger surface area. Paint the Light Fantastic! Special offer: Use the code “LKW_20” for a 20 percent discount available only through National Parks at Night. Night photography’s new darling tool! Ideal for light painting and Low-level Landscape Lighting effects. The Luxli Viola’s native color temperature adjusts from 3000 K to 10,000 K, and you can also dial in all the colors in the world. Bonus: Bluetooth control for remote intensity and color adjustments of up to nine Violas at a time. Wow. Manfrotto’s new update to the Befree tripod series boasts some cool features: the lightweight yet strong 494 ball head, M-lock mechanisms for fast setup or QPL Travel Levers for those who prefer flip locks, and a newly redesigned body that’s stronger and smaller. Here’s a great gift for yourself or that night photography friend of yours. Our National Parks at Night 2018 Calendar, featuring photos from parks around the United States—plus Iceland and Scotland—is an inspiring way to stay up to date. Useful information such as important astronomical events, lunar dates and national park birthdays are included to help you plan your shoots. You haven’t seen a digital frame until you’ve had the pleasure of seeing a Memento. Situated in a wood composite frame and a beveled mat, the ultra-HD 4K display contains 7 million pixels that will make your photographs look even better than you can imagine. Controlled completely by Wi-Fi via a free app on your computer, tablet or phone (even remotely! ), the frame can store up to 3,000 images. Group your photos in playlists to display at different times of day, and custom-set the interval from 5 seconds to one week to never. Moreover, the frame’s smart technology will dim the display in low light, and turn off when the room lights turn out. Offered in 25- and 35-inch models in five stain colors. A brilliant coffee table book released this fall, National Geographic Night Vision: Magical Photographs of Life After Dark After Dark offers a collection of 230 photographs from some of the best image-makers in the business. 400 pages of night photography from both natural and urban spaces all over the world, including national parks. We can only assume that you must be a fan of our primary source of inspiration, the United States’ 59 amazing national parks! You probably know that the America the Beautiful pass gains access to all of those parks for a full year, but did you know that the annual or lifetime senior pass also gets you access to over 2,000 federal recreation sites including national monuments, wildlife refuges, national forests and grasslands, and to sites managed by the Bureau of Land Management, Bureau of Reclamation and U.S. Army Corps of Engineers? The passes cover entrance, fees for a driver and all passengers in a personal vehicle. The cost of the annual pass is $80, or $20 for seniors over the age of 62. Seniors can also buy a lifetime pass for $80. Passes are free for American veterans, Americans with permanent disabilities, and fourth-graders! 2017 is the centennial of the Nikon Corporation, and the D850 is a truly worthy camera to be released on such a momentous occasion. If you haven’t heard about the D850 by now, you must still be shooting film. Designed as a replacement for the venerable D810, this camera is a night photographer’s dream. Super high resolution, extremely wide dynamic range and outstanding high ISO performance, all in a weatherized housing that is only slightly heavier than a D750. National Parks at Night just had our first experiences with this great new camera at our last workshop of 2017. Now it’s on all of our holiday wish lists! Even in some of the darkest locations in the world, the night sky is still tainted by light pollution, much of which is due to ubiquitous high pressure sodium vapor lights. The NiSi Natural Night Filter minimizes scattered light from sodium vapor and mercury vapor street lights. Natural-Night is available in 100x100mm and 150x150mm square filters, and 77mm and 82mm threaded filters. The result is more pleasing, natural-looking skies in your astro and astro-landscape photos. The photography world is full of fine publications, and one that speaks directly to us and our like is Outdoor Photographer—dedicated to helping photographers capture their very best images of the natural world. From how-to articles to location advice to travel stories to gear reviews and more, Outdoor Photographer will keep readers focused on the latest and greatest news in our niche. Available in print and digital subscriptions. We simply love being outdoors, teaching and helping people get great pictures. Many of our 2018 Passport Series workshops are full, but we do have a few slots open on our Biscayne, Redwood and Rocky Mountain national park events. Last year we added the Adventure Series workshops to our lineup too, so that we could visit the varied and limitless beauty that lies outside of our national parks and teach special topics or advanced techniques. Experience the unfettered creativity of night portraiture, explore the depths of a metal machinery in Sloss Furnaces, or light paint the ancient Pueblo ruins of Chaco Canyon. Our road trips include the Blue Ridge Parkway and the south coast of Iceland. Come seize the night with us in 2018! There’s a communication barrier between photographers and their computer. We need to tell them what to do, but we’re limited by the languages of key presses, mouse movements, trackpad gestures, tablet scribblings, et al. Palette eases that communication by providing a suite of custom-configurable modules that you can use to tell Lightroom and Photoshop (and more!) exactly what to do with intuitive motions and tools. Slide a slider for exposure, turn a dial for color temperature, push a button for picks or rejects, and so on. Choose your options to fit your workflow, and finally you and your computer will be speaking the same language. Multiple kits available—the Expert Kit is a great place to start. Big bags are great for transporting your gear from point A to B, C and beyond. But we always bring a smaller bag with us that is better for a smaller, simpler, scouting kit. The Peak Design Everyday Sling 10L has been a favorite of ours this last year. We can fit a DSLR or mirrorless camera plus two to three lenses and a flash. There’s lots of room for extra batteries and cards, and you can even strap a travel tripod to the bottom. We were so impressed with the Everyday Sling 10L that we made a video in the Galapagos showcasing how much you could pack in it! Looking for something even smaller? Peak Design just announced the even more compact Everyday Sling 5L. It’s perfect for a DSLR and up to a 24-70mm/24-105mm lens or a mirrorless camera plus two lenses, and also works excellently for transporting the DJI Mavic Pro and Spark Drones. Special offer: Receive a free gift with a purchase over $65 by using the link above. For the shooter who wants to get the most out of their night photography, there isn’t a more full-featured tool than the app PhotoPills. Our favorite feature is Night AR (Augmented Reality), where you can observe the location of the Milky Way, moon and more—all overlaid on the scene in front of you, with sky positions now and in the future. That makes being in the right place at the right time easy! Available for iOS and Android. The original national park poster program was launched in 1938 and lasted until 1941. They used WPA artists to give their now nostalgic interpretation of our national parks. Due to the posters’ fragile nature, only 2,000 original copies have survived. However, Ranger Doug Enterprises (founded by an actual former national park ranger) has faithfully reproduced these serigraph images as posters and cards. They make the perfect memorabilia to hang on your wall. Or, send a postcard to a friend with detailed plans on your next national park adventure! Tea lights, really? Yes! A super inexpensive and lightweight addition to the light painter’s tool kit. They are easy to place in hard-to-paint areas and are great for long exposure night photography. These low-output LED light sources mimic the natural light of a candle, and last for over 100 hours. The National Parks at Night instructors have written five books that are definitive guides to popular photography subjects, all of which make excellent gifts. Moreover, the complete set can keep the photographer in your life well informed and educated about topics ranging from national park locations to how to shoot in the dark. Like a Snuggie for your intervalometer. Avoid stressing the jack on the side of your camera by storing your intervalometer or remote shutter release on your tripod leg in this handy case by Ruggard. Simple to attach with hook and loop fastener, and always there when you need it. We’ll never stop saying it: The first priority when working in the dark is safety. And one of the starting points of safety is where your feet meet the earth. Walking around in the dark in the wilderness requires footing you can rely on, and Salomon is one of our favorite solutions. Their XA Pro 3D trail-runners have a wide heel base that helps prevent rolling an ankle, an aggressive tread that keeps you from slipping while toeing from spot to spot, and light weight that makes moving around a breeze—particularly with expensive camera gear on your back or your shoulder. Available in breathable mesh and Gore Tex waterproof models (we own and use both!). Harun Mehmedinovic and Gavin Heffernan have been making incredible time-lapse movies promoting dark sky awareness for several years. A year ago they Kickstarted the SkyGlow astrophotography book and time-lapse video series. Educate yourself on dark sky locations and light-polluted cities in North America in their beautiful coffee table book. Special offer: Use the code “SKYGLOW15” for 15 percent off everything in their store until December 26th. In addition, the first 500 orders priced $25 and above will also receive a signed 10x7-inch archival quality print! Keep your cables and cords nice and tidy with Tether Tools ProTab Cable Ties. Great for keeping all those wires that we have in our life organized, and for keeping them from being tangled together when packing and transporting. We find the medium size works best for our computer, charging, headphone and intervalometer cables. But they have larger sizes perfect for extension cords, surge protectors and the like. Which national park is home to Exit Glacier? In which state are 17 of the 20 highest peaks in the U.S. found? Which chatty, problem-solving avian found in Arches National Park is a prominent figure in both European and Native American folklore? Do you know those answers? Then you win! With Trivial Pursuit National Parks edition, one up on the essential and obscure facts about America’s beloved National Parks anywhere. Heck, you can even play the game with other people! We discovered this in the gift shop at Olympic National Park and bought it on the spot. Included is a plastic hard case that feels like a weather-beaten sign, carabiner and die for play. Fits neatly in a camera bag! Finding the right glove for night photography has been an ongoing project for us at National Parks at Night. There are lots of options to choose from, but until now the right glove for truly cold weather proved elusive. The challenge was to design a glove that offers both protection from extreme cold and the dexterity to operate a camera in those same conditions. The Ipsoot photography glove from Vallerret is a heavier duty glove that provides extra protection against the elements for when it really gets cold. If a little cold won’t slow you down, and you still want to get out there and shoot in the dead of winter, the new Ipsoot Glove is the answer. It’s hard to see in the dark, and even though lots of cameras have a built-in level to help us keep our horizon line straight, we find that the external Vello Three-Axis Hot-Shoe Bubble Level does a far superior job. This bubble level really shines when we shoot off axis—such as when we shoot upward to include more sky. The level is simple, small and slides right into your hot shoe to keep you on the level! Don’t assume you’re seeing the right colors or brightness. Know it. Calibrate your monitors, mobile devices, projectors and printers with the all-encompassing solution: X-Rite’s i1Studio. Included is a mini ColorChecker for making camera profiles and color-balancing your RAW files. If you don’t use color management, then when you post or print, your final product might not match the way you want it to! Be calibrated; be sure. 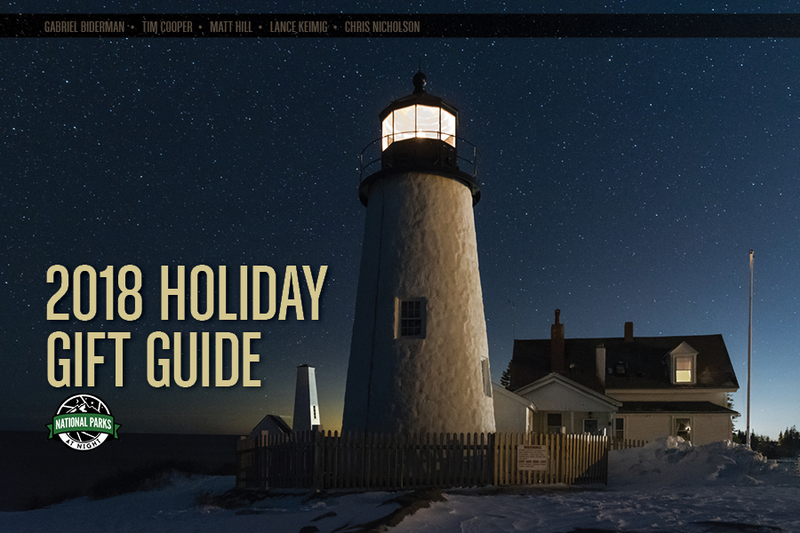 And remember, this gift guide is also available as a PDF e-book that includes lots more photos, an exclusive discount code on one of the products mentioned above, and photo tips from Chris, Matt, Tim, Lance and myself. You can download the PDF by clicking right here. Well, the holidays are upon us. How can I tell? I’ve eaten turkey-based foodtstuff six days in a row. With that in mind (the holidays, not turkey), I and my National Parks at Night partners started thinking about things we’d like as gifts. … Oops, I mean things that other night photographers might like as gifts. So we put together a list of great products related to photography, the night sky and the national parks, then thought about why we love these items. Then we wrote it all up and published it as our very first "National Parks at Night Holiday Gift Guide." Feel free to share the guide, too. Blog it. Tweet it. Facebook it. Email it to a friend. Print some copies and stand in Times Square shouting, "Hear ye hear ye read all about it! Amazing gifts for night photographers!" Holidays are for happiness, so spread the cheer. We hope that perusing the items in the guide will inspire you to give some great gifts to the night photographers in your life. And if you’d like to give us one or two of these things, we won't argue! However, the photography industry is full of products that do help us, or that we covet at least for the fun of owning and using them. In one way or another, all help us make better photos, and all help us have more fun in the dark. If you’re searching for the perfect gift for the nocturnal photographer in your life, then we’re here to help. The following includes a few of our favorite things for seizing the night. p.s. — If you decide to purchase any of the items in this gift guide, please consider using the links included, as many help earn a small commission that supports the National Parks at Night workshop program. A tablet is one of the most useful ancillary tools in modern photography. The iPad Mini 4 is certainly among the best in the category, and easy to carry in a camera bag. Use it for apps that help you scout national park locations—such as Chimani, Photo Pills or Photographer’s Ephemeris. Or use it for apps that help you produce better night photography—such as Tack Sharp or even Adobe Photoshop Lightroom. Also use it for keeping up with emails, making photo notes on-site, or carrying your portfolio of fantastic night images everywhere you go. We promise you—if you want to let the photographer decide, there’s no gift card they’d rather have than one from the mothership of all camera stores, B&H. Cards are available in varying amounts, can be used online or in-store, and they fit perfectly in a stocking. Hands-down, our favorite flashlight for light painting. The HP7R outputs up to 300 lumens of bright light in a perfectly even beam, allowing for smooth painting of objects near or far, and features three power modes and a slide focus for honing or broadening the illumination. It can be powered by either alkaline or lithium batteries, and rechargeables can be recharged right inside the casing using the included micro USB connector. Moreover, the HP7R is impact- and weather-resistant and comes with a lifetime warranty. CreativeLive offers some of the very best photography education on the internet, and our favorite (though we admit bias) is the Night Photography Week bundle we created with them in 2016. From the entire National Parks at Night crew, learn about gear, scouting, astrolandscapes, light painting, night portraiture and more. The course comprises nearly 18 hours of instruction in 82 class segments, plus bonus materials that include information on camera and light-painting gear, lists of apps to help with location scouting and night photography, and articles about topics such as camera settings and the 400 Rule. The end product of successful photography is a beautiful print, but in this busy modern age too few of us have time to dedicate to our digital darkroom. So the perfect gift for the photographer in your life could be a top-notch print of his or her work. Digital Silver Imaging is the place to get it. DSI combines the best of digital technology and chemical-based silver printing to create works of stunning quality. The proof is in the print, or in the clientele—regular DSI customers include museums, collectors and photographers with a discerning eye for perfection. For the past couple of years Gitzo had been promising an A-grade ball head, and then they delivered an A+ instead. The GH3382QD Arca-type compatible head is low-profile, low-weight and can hold a 40-pound camera/lens combo with no creep or fuss. Moreover, loosen the screw-knob lock and due to the tungsten disulfide coating, the ball moves 360 degrees as smooth as silk. If you’re tired of your intervalometer dangling from your tripod, blowing in the wind, shaking your camera and ruining your long exposures, the most elegant solution we’ve seen is the Intervalock. Secured to a tripod leg by a Velcro strap, this portable pocket will keep almost any model of intervalometer still and accessible. Light Painting Brushes offers a comprehensive set of unique light-writing tools that is sure to stir the creative juices of any night photographer. Their Deluxe Starter Kit includes universal flashlight connectors, along with tools for creating light orbs, light sculptures, light graffiti and anything else you can imagine. One of the challenges of photographing astrolandscapes is focusing on the sky in the dark. That’s where Sharpstar2 saves the day (er, the night). Based on astronomy technology, this special filter uses a Bahtinov Mask to help you achieve perfect focus on the stars. Simply verify the focus pattern in your camera’s Live View, and sharpness is assured. Night photographers need support that is strong and stable, as well as easy to use in the dark. We also like a lack of weight, particularly because we’re often carrying two tripods into the field for multiple long-exposure setups. The Manfrotto 190go! exceeds all these needs as the perfect tripod for either a primary or secondary support system (or both!). It closes down to less than 18 inches and is available in aluminum and superlight carbon fiber versions. Plus, to create an all-in-one night photography support solution, add an Easy Link attachment to hold a focusing light. For the national parks buff, little is more satisfying than tracking where you’ve explored. Mappinners helps with its National Parks Scratch Off Travel Map. This 36x24-inch awesome wall decoration features scratch-off spots for all 59 U.S. national parks, so you can track your footsteps across the country’s greatest natural spaces. We photographers love to visit national parks, and for good reason: They contain some of the most wonderful wildernesses in all of the land, ready for our cameras and creative minds. But gosh, those entrance fees can add up. That’s why a National Park Service annual pass is an ideal complement to any photographer’s pocket. For just $80 (or $20 for seniors—lifetime! ), the holder can enter any NPS unit for free. Four of the National Parks at Night instructors have written definitive guides to popular photography subjects, all of which make excellent gifts. Moreover, the complete set can keep the photographer in your life well informed and educated about topics ranging from national park locations to how to shoot in the dark. We’ve compiled a ton of information useful to night photographers—including the dates of new and full moons, national park night-sky festivals, celestial and astronomical events, astronomy holidays (yep), as well as inspirational quotes about the night sky—and combined it with some of our favorite national parks night photographs. The result? “Seize the Night,” our very first wall calendar! Put simply, you can’t get a better camera for night photography, particularly at this price point. At under $2,000, the Nikon D750 has everything a night photographer could want in a body right now: It has low noise at high ISOs, ISO invariance, ability to pull tremendous detail out of underexposed images, and a T (time) setting on the shutter speed dial, as well as being lightweight and compact. But really, it’s all about the image quality, and the D750 outshines all the other options under the stars. To level up the gift, add one of the best lenses for seizing the night, the Nikkor 14-24mm f/2.8. There are the usual ways of manipulating adjustment controls in Lightroom and Photoshop—a mouse or a touchpad (ack!) to name the very most common two. Both can be tedious. But you know what’s a lot easier? Using the sliders, dials and buttons provided with a Palette Aluminum Professional Control Surface Kit. Assign each tool to whatever adjustment you want, and digital editing gets much more intuitive. Other size kits are available, and the module configuration is completely customizable. Palette also works with Illustrator, After Effects, InDesign, Premiere Pro and Final Cut Pro. For spacious and convenient storage in a robust yet exquisite design, look no further. The Everyday Backpack, available in two sizes, holds just about anything you need when venturing into the field or into the office. It’s adaptable, partly due to moveable dividers, and partly due to the integration of Peak Design’s Capture Clip points that allow you to quickly attach or detach cameras or accessories. And while it’s great at holding whatever you need it to, the MagLatch clasp and the dual side-loading, weatherproof, zippered access points facilitate getting those things in and out quickly. Also, look into the optional Field Pouch, a perfect size for storing light-painting tools. Long night exposures can deplete a camera battery pretty quickly. The best power-loss prevention is a hearty external battery. Tether Tools offers an ideal solution with its Case Relay, a light and portable setup that, when combined with their rechargeable 10,000-mAh Rock Solid External Battery Pack, can keep you powered-up all night. Tyler Nordgren—an astronomer, astronomy professor and avid night photographer based in California—offers a fresh perspective on our favorite topic: the night skies of the national parks. In Stars Above, Earth Below: A Guide to Astronomy in the National Parks, Nordgren touches on many of the night-sky wonders we encounter in our most precious spaces, helping us better understand what we’re so passionate about photographing. Also check out Nordgren’s series of “Half the Park is After Dark” posters from his dark-sky awareness campaign with the National Park Service. Night photographers often find themselves in finger-numbing conditions, so yes, those warm woolen mittens we mentioned earlier really would be handy. But even better is the Trigger Mitt, a set of gloves designed specifically for photographers working in cold conditions (like, ya know, night). More accurately a half-glove, half-mitten, the Trigger Mitt is designed to keep unused photo fingers together and warm, while allowing the thumb and pointer to move freely. A thin but comfy layer of insulation keeps the Mitts more pliable than the ski gloves that so many photographers use, ensuring that you maintain a great feel for your camera. An intervalometer is practically required gear for the night photographer—so important that it’s even a good idea to carry an extra. The Shutterboss II is one of our most preferred. The backlit display is easy to read at night, making it simple to configure for continuous shooting, self-timer, long time exposures and interval shooting. Once the photos are home in the computer, we want them to look right—and helping us do that is X-Rite. The i1Display Pro works with all modern monitors, ensuring color accuracy throughout your entire workflow, from screen to print or projector. Features include Advanced Filter and Optical Systems, and an ambient meter that can adjust your display output in changing light conditions.